What a fantastic Big Spring Sing Together we had on Saturday 1st April. 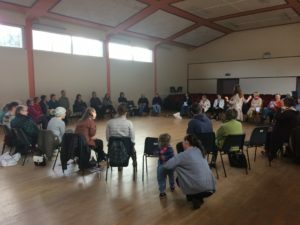 Over 30 people came from existing Sing Together groups and some came just to try it out; meeting, talking, eating and singing together. We had a great time and produced some beautiful sounds. Sing Together evening groups will take a break from Easter resuming in September. Keep an eye out for one off Sing Together events throughout the summer on my Facebook page and on this website. Already booked is a Sing Together in the Woods slot at the Ballinamore Free Fringe Festival (July 21st -23rd) and a slot in the Library during Heritage Week in Carrick on Shannon Wednesday 23rd August 7-9pm.